An amazing 322 page reference book for all types of boatbuilding. - Exceptional production created by amalgamating six separate editions of the renowned series, Plate Alloy Boats Of Australia. First published in 1998, a new edition, based around different boats each time, was published roughly every two years. 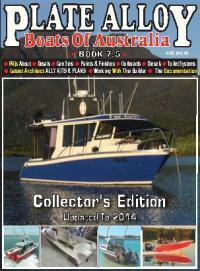 Immensely popular with both amateur and professional boatbuilders, the first four printed editions sold out long ago, but demand for the unique and very specialised articles in them has continued unabated. With only a handful of the fifth and sixth editions left, something had to be done � and after months of culling, editing, and re-organising, this 322 page amalgamated, online production has emerged for international release in 2013. The whole book downloads immediately and can be saved to your computer and then used 24/7 without needing an internet connection. The total size of the PAB-7 download is just 27mb, a very manageable figure for today�s iPads, laptops, tablets, etc, let alone home or business computers. Awesome 322 Page book with proper easy to read magazine graphics to read on your computer, laptop, i-pad, android tablet or mini ipad. The PDFs may be saved to your device then read or printed without internet connection. Buy this book now and it will download immediately! Distribution: The whole book with proper magazine graphics downloads immediately to your computer as a PDF file. Description: Awesome 322 Page book to read on your computer, tablet or ipad. PDFs may be saved and printed too.